For other uses, see Julius Caesar (disambiguation). "Caesar" redirects here. For other uses, see Caesar (disambiguation). Gaius Julius Caesar (Classical Latin: [ˈɡaː.i.ʊs ˈjuː.lɪ.ʊs ˈkaj.sar], July 100 BC – 15 March 44 BC) was a Roman general, statesman, Consul and notable author of Latin prose. He played a critical role in the events that led to the demise of the Roman Republic and the rise of the Roman Empire. In 60 BC, Caesar, Crassus and Pompey formed a political alliance that was to dominate Roman politics for several years. Their attempts to amass power through populist tactics were opposed by the conservative elite within the Roman Senate, among them Cato the Younger with the frequent support of Cicero. Caesar's conquest of Gaul, completed by 51 BC, extended Rome's territory to the English Channel and the Rhine. Caesar became the first Roman general to cross both when he built a bridge across the Rhine and conducted the first invasion of Britain. After assuming control of government, Caesar began a program of social and governmental reforms, including the creation of the Julian calendar. He centralised the bureaucracy of the Republic and was eventually proclaimed "dictator in perpetuity". 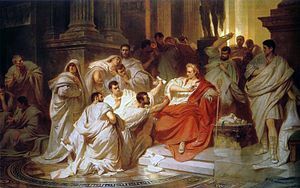 But the underlying political conflicts had not been resolved, and on the Ides of March (15 March) 44 BC, Caesar was assassinated by a group of senators led by Marcus Junius Brutus. A new series of civil wars broke out, and the constitutional government of the Republic was never restored. Caesar's adopted heir Octavian, later known as Augustus, rose to sole power, and the era of the Roman Empire began. In 85 BC, Caesar's father died suddenly, so at sixteen Caesar was the head of the family. His coming of age coincided with a civil war between his uncle, Gaius Marius, and his rival Lucius Cornelius Sulla. Both sides, whenever they were in the ascendancy, carried out bloody purges of their political opponents. While Marius and his ally, Lucius Cornelius Cinna, were in control of the city, Caesar was nominated to be the new high priest of Jupiter, and married to Cinna's daughter Cornelia. But following Sulla's final victory, Caesar's connections to the old regime made him a target for the new one. He was stripped of his inheritance, his wife's dowry and his priesthood, but he refused to divorce Cornelia and was forced to go into hiding. The threat against him was lifted by the intervention of his mother's family, which included supporters of Sulla, and the Vestal Virgins. Sulla gave in reluctantly, and is said to have declared that he saw many a Marius in Caesar. Caesar left Rome and joined the army, where he won the Civic Crown for his part in an important siege. On a mission to Bithynia to secure the assistance of King Nicomedes's fleet, he spent so long at his court that rumors of an affair with the king arose, which Caesar would vehemently deny for the rest of his life. Ironically, the loss of his priesthood had allowed him to pursue a military career, as the high priest of Jupiter was not permitted to touch a horse, sleep three nights outside his own bed or one night outside Rome, or look upon an army. Hearing of Sulla's death in 78 BC, Caesar felt safe enough to return to Rome. Lacking means since his inheritance was confiscated, he acquired a modest house in Subura, a lower-class neighborhood of Rome. He turned to legal advocacy, and became known for his exceptional oratory, accompanied by impassioned gestures and a high-pitched voice, and ruthless prosecution of former governors notorious for extortion and corruption. In 63 BC, he ran for election to the post of Pontifex Maximus, chief priest of the Roman state religion. He ran against two powerful senators. There were accusations of bribery by all sides. Caesar won comfortably, despite his opponents' greater experience and standing. 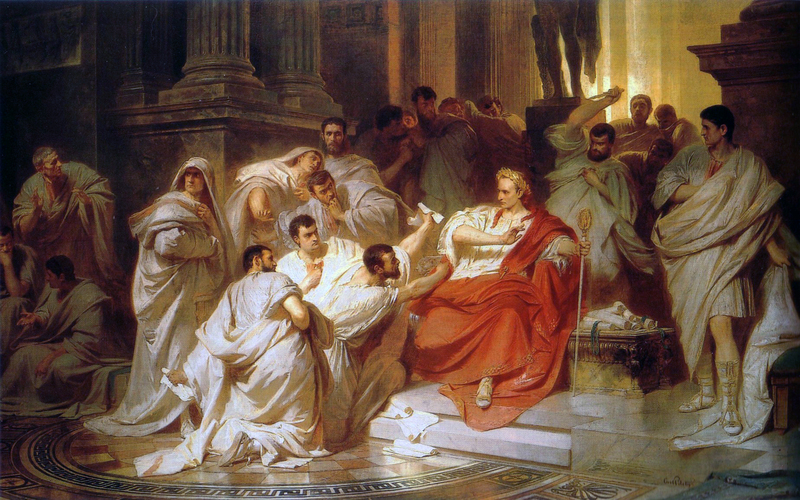 When Cicero, who was consul that year, exposed Catiline's conspiracy to seize control of the republic, several senators accused Caesar of involvement in the plot. After serving as praetor in 62 BC, Caesar was appointed to govern Spain, probably with proconsular powers. He was still in considerable debt and needed to satisfy his creditors before he could leave. He turned to Marcus Licinius Crassus, one of Rome's richest men. In return for political support in his opposition to the interests of Pompey, Crassus paid some of Caesar's debts and acted as guarantor for others. Even so, to avoid becoming a private citizen and thus be open to prosecution for his debts, Caesar left for his province before his praetorship had ended. In Spain, he conquered two local tribes and was hailed as imperator by his troops, reformed the law regarding debts, and completed his governorship in high esteem. As imperator, Caesar was entitled to a triumph. However, he also wanted to stand for consul, the most senior magistracy in the republic. If he were to celebrate a triumph, he would have to remain a soldier and stay outside the city until the ceremony, but to stand for election he would need to lay down his command and enter Rome as a private citizen. He could not do both in the time available. He asked the senate for permission to stand in absentia, but Cato blocked the proposal. Faced with the choice between a triumph and the consulship, Caesar chose the consulship. In 60 BC, Caesar sought election as consul for 59 BC, along with two other candidates. The election was sordid – even Cato, with his reputation for incorruptibility, is said to have resorted to bribery in favor of one of Caesar's opponents. Caesar won, along with conservative Marcus Bibulus. Caesar proposed a law for the redistribution of public lands to the poor, a proposal supported by Pompey, by force of arms if need be, and by Crassus, making the triumvirate public. Pompey filled the city with soldiers, a move which intimidated the triumvirate's opponents. Bibulus attempted to declare the omens unfavorable and thus void the new law, but was driven from the forum by Caesar's armed supporters. His bodyguards had their ceremonial axes broken, two high magistrates accompanying him were wounded, and he had a bucket of excrement thrown over him. In fear of his life, he retired to his house for the rest of the year, issuing occasional proclamations of bad omens. These attempts to obstruct Caesar's legislation proved ineffective. Roman satirists ever after referred to the year as "the consulship of Julius and Caesar." In response to Caesar's earlier activities, the tribes in the north-east began to arm themselves. Caesar treated this as an aggressive move and, after an inconclusive engagement against the united tribes, he conquered the tribes piecemeal. Meanwhile, one of his legions began the conquest of the tribes in the far north (directly opposite Britain). During the spring of 56 BC, the Triumvirs held a conference, as Rome was in turmoil and Caesar's political alliance was coming undone. The Lucca Conference renewed the First Triumvirate and extended Caesar's governorship for another five years. The conquest of the north was soon completed, while a few pockets of resistance remained. Caesar now had a secure base from which to launch an invasion of Britain. 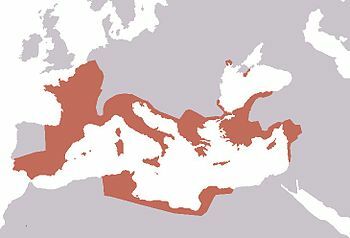 The extent of the Roman Republic in 40 BC after Caesar's conquests. In 55 BC, Caesar repelled an incursion into Gaul by two Germanic tribes, and followed it up by building a bridge across the Rhine and making a show of force in Germanic territory, before returning and dismantling the bridge. Late that summer, having subdued two other tribes, he crossed into Britain, claiming that the Britons had aided one of his enemies the previous year possibly the Veneti of Brittany. His intelligence information was poor, and although he gained a beachhead on the coast, he could not advance further, and returned to Gaul for the winter. He returned the following year, better prepared and with a larger force, and achieved more. He advanced inland, and established a few alliances. However, poor harvests led to widespread revolt in Gaul, which forced Caesar to leave Britain for the last time. While Caesar was in Britain his daughter Julia, Pompey's wife, had died in childbirth. Caesar tried to re-secure Pompey's support by offering him his great-niece in marriage, but Pompey declined. In 53 BC Crassus was killed leading a failed invasion of the east. Rome was on the edge of civil war. Pompey was appointed sole consul as an emergency measure, and married the daughter of a political opponent of Caesar. The Triumvirate was dead. In 52 BC another, larger revolt erupted in Gaul, led by Vercingetorix. Vercingetorix managed to unite the Gallic tribes and proved an astute commander, defeating Caesar in several engagements, but Caesar's elaborate siege-works at the Battle of Alesia finally forced his surrender. 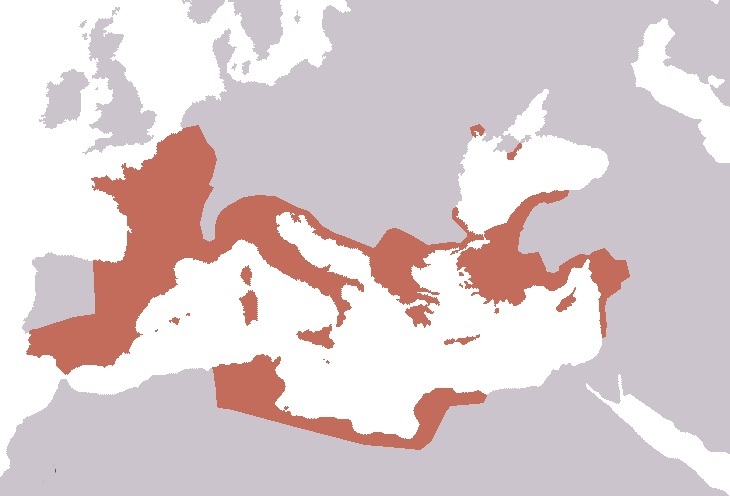 Despite scattered outbreaks of warfare the following year, Gaul was effectively conquered. Plutarch claimed that the army had fought against three million men during the Gallic Wars, of whom one million died, and another million were enslaved. The Romans subjugated 300 tribes and destroyed 800 cities. However, in view of the difficulty in finding accurate counts in the first place, Caesar's propagandistic purposes, and the common exaggeration of numbers in ancient texts, the stated totals of enemy combatants are likely to be too high. Erasmus, however, notes that the more accurate translation of the Greek imperative mood would be "alea icta esto" let the die be cast. Pompey and much of the Senate fled to the south, having little confidence in his newly raised troops. Despite greatly outnumbering Caesar, who only had his Thirteenth Legion with him, Pompey did not intend to fight. Caesar pursued Pompey, hoping to capture him before his legions could escape. Pompey managed to escape before Caesar could capture him. Heading for Spain, Caesar left Italy under the control of Mark Antony. After an astonishing 27-day route-march, Caesar defeated Pompey's lieutenants, then returned east, to challenge Pompey in Greece where, in July 48 BC at Dyrrhachium, Caesar barely avoided a catastrophic defeat. In an exceedingly short engagement later that year, he decisively defeated Pompey at Pharsalus. 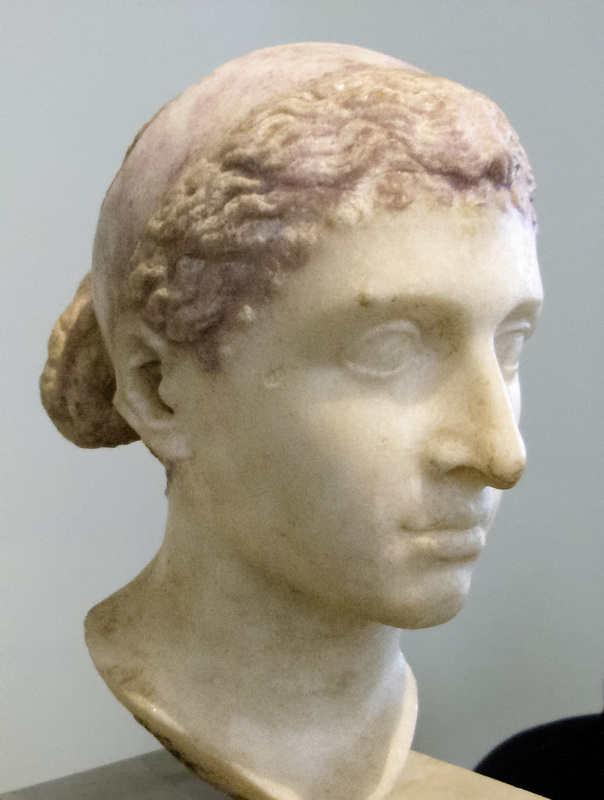 A bust of Cleopatra VII. In Rome, Caesar was appointed dictator, with Mark Antony as his Master of the Horse (second in command); Caesar presided over his own election to a second consulship and then, after eleven days, resigned this dictatorship. Caesar then pursued Pompey to Egypt, arriving soon after the murder of the general. There Caesar was presented with Pompey's severed head and seal-ring, receiving these with tears. He then had Pompey's assassins put to death. Caesar and Cleopatra never married, as Roman law recognized marriages only between two Roman citizens. Caesar continued his relationship with Cleopatra throughout his last marriage, which lasted fourteen years – in Roman eyes, this did not constitute adultery – and may have fathered a son called Caesarion. Cleopatra visited Rome on more than one occasion, residing in Caesar's villa just outside Rome across the Tiber. Late in 48 BC, Caesar was again appointed Dictator, with a term of one year. After spending the first months of 47 BC in Egypt, Caesar went to the Middle East, where he annihilated the king of Pontus; his victory was so swift and complete that he mocked Pompey's previous victories over such poor enemies. On his way to Pontus, Caesar visited from 27 to 29 May 47 BC, (25–27 Maygreg.) Tarsus, where he met enthusiastic support, but where, according to Cicero, Cassius was planning to kill him at this point. Thence, he proceeded to Africa to deal with the remnants of Pompey's senatorial supporters. He quickly gained a significant victory in 46 BC over Cato, who then committed suicide. After this victory, he was appointed Dictator for ten years. Pompey's sons escaped to Spain; Caesar gave chase and defeated the last remnants of opposition in the Battle of Munda in March 45 BC. During this time, Caesar was elected to his third and fourth terms as consul in 46 BC and 45 BC (this last time without a colleague). When Caesar returned to Rome, the Senate granted him triumphs for his victories, ostensibly over Gaul, Egypt, Pharnaces and Juba, rather than over his Roman opponents. Not everything went Caesar's way. When Arsinoe IV, Egypt's former queen, was paraded in chains, the spectators admired her dignified bearing and were moved to pity. Triumphal games were held, with beast-hunts involving 400 lions, and gladiator contests. A naval battle was held on a flooded basin at the Field of Mars. At the Circus Maximus, two armies of war captives, each of 2,000 people, 200 horse and 20 elephants, fought to the death. Again, some bystanders complained, this time at Caesar's wasteful extravagance. A riot broke out, and only stopped when Caesar had two rioters sacrificed by the priests on the Field of Mars. After the triumph, Caesar set forth to passing an ambitious legislative agenda. He ordered a census be taken, which forced a reduction in the grain dole, and that jurors could only come from the Senate or the equestrian ranks. He passed a sumptuary law that restricted the purchase of certain luxuries. After this, he passed a law that rewarded families for having many children, to speed up the repopulation of Italy. Then he outlawed professional guilds, except those of ancient foundation, since many of these were subversive political clubs. He then passed a term limit law applicable to governors. He passed a debt restructuring law, which ultimately eliminated about a fourth of all debts owed. The most important change, however, was his reform of the calendar. The calendar at the time was regulated by the movement of the moon, and this had resulted in a great deal of disorder. Caesar replaced this calendar with the Egyptian calendar, which was regulated by the sun. He set the length of the year to 365.25 days by adding an intercalary/leap day at the end of February every fourth year. He also wanted to convert Ostia to a major port, and cut a canal through the Isthmus of Corinth. Militarily, he wanted to conquer the Dacians, Parthians, and avenge the loss at Carrhae. Thus, he instituted a massive mobilization. Shortly before his assassination, the Senate named him censor for life and Father of the Fatherland, and the month of Quintilis was renamed July in his honor. He was granted further honors, which were later used to justify his assassination as a would-be divine monarch; coins were issued bearing his image and his statue was placed next to those of the kings. He was granted a golden chair in the Senate, was allowed to wear triumphal dress whenever he chose, and was offered a form of semi-official or popular cult, with Mark Antony as his high priest. The history of Caesar's political appointments is complex and uncertain. Caesar held both the dictatorship and the tribunate, but alternated between the consulship and the Proconsulship. His powers within the state seem to have rested upon these magistracies. He was first appointed dictator in 49 BC possibly to preside over elections, but resigned his dictatorship within eleven days. In 48 BC, he was re-appointed dictator, only this time for an indefinite period, and in 46 BC, he was appointed dictator for ten years. In 48 BC, Caesar was given permanent tribunician powers, which made his person sacrosanct and allowed him to veto the Senate, although on at least one occasion, tribunes did attempt to obstruct him. The offending tribunes in this case were brought before the Senate and divested of their office. This was not the first time that Caesar had violated a tribune's sacrosanctity. After he had first marched on Rome in 49 BC, he forcibly opened the treasury although a tribune had the seal placed on it. After the impeachment of the two obstructive tribunes, Caesar, perhaps unsurprisingly, faced no further opposition from other members of the Tribunician College. Caesar even took steps to transform Italy into a province, and to link more tightly the other provinces of the empire into a single cohesive unit. This addressed the underlying problem that had caused the Social War decades earlier, where individuals outside Rome and Italy were not considered "Roman", and thus were not given full citizenship rights. This process, of fusing the entire Roman Empire into a single unit, rather than maintaining it as a network of unequal principalities, would ultimately be completed by Caesar's successor, the emperor Augustus. When Caesar returned to Rome in 47 BC, the ranks of the Senate had been severely depleted, and so he used his censorial powers to appoint many new senators, which eventually raised the Senate's membership to 900. All the appointments were of his own partisans, which robbed the senatorial aristocracy of its prestige, and made the Senate increasingly subservient to him. To minimize the risk that another general might attempt to challenge him, Caesar passed a law that subjected governors to term limits. At the same time, Casca produced his dagger and made a glancing thrust at the dictator's neck. Caesar turned around quickly and caught Casca by the arm. According to Plutarch, he said in Latin, "Casca, you villain, what are you doing?" Casca, frightened, shouted, "Help, brother!" in Greek ("ἀδελφέ, βοήθει", "adelphe, boethei"). Within moments, the entire group, including Brutus, was striking out at the dictator. Caesar attempted to get away, but, blinded by blood, he tripped and fell; the men continued stabbing him as he lay defenceless on the lower steps of the portico. According to Eutropius, around 60 or more men participated in the assassination. He was stabbed 23 times. According to Suetonius, a physician later established that only one wound, the second one to his chest, had been lethal. The dictator's last words are not known with certainty, and are a contested subject among scholars and historians alike. Suetonius reports that others have said Caesar's last words were the Greek phrase "καὶ σύ, τέκνον;" (transliterated as "Kai su, teknon? ": "You too, child?" in English). However, for himself, Suetonius says Caesar said nothing. Plutarch also reports that Caesar said nothing, pulling his toga over his head when he saw Brutus among the conspirators. The version best known in the English-speaking world is the Latin phrase "Et tu, Brute?" ("And you, Brutus? ", commonly rendered as "You too, Brutus? "); this derives from Shakespeare's Julius Caesar, where it actually forms the first half of a macaronic line: "Et tu, Brute? Then fall, Caesar." It has no basis in historical fact and Shakespeare's use of Latin here is not from any assertion that Caesar would have been using the language, rather than the Greek reported by Suetonius, but because the phrase was already popular when the play was written. According to Plutarch, after the assassination, Brutus stepped forward as if to say something to his fellow senators; they, however, fled the building. Brutus and his companions then marched to the Capitol while crying out to their beloved city: "People of Rome, we are once again free!" They were met with silence, as the citizens of Rome had locked themselves inside their houses as soon as the rumor of what had taken place had begun to spread. Caesar's dead body lay where it fell on the Senate floor for nearly three hours before other officials arrived to remove it. Caesar's body was cremated, and on the site of his cremation the Temple of Caesar was erected a few years later (at the east side of the main square of the Roman Forum). Nowadays, only its altar remains. A lifesize wax statue of Caesar was later erected in the forum displaying the 23 stab wounds. A crowd who had gathered there started a fire, which badly damaged the forum and neighboring buildings. In the ensuing chaos Mark Antony, Octavian (later Augustus Caesar), and others fought a series of five civil wars, which would end in the formation of the Roman Empire. The result unforeseen by the assassins was that Caesar's death precipitated the end of the Roman Republic. The Roman middle and lower classes, with whom Caesar was immensely popular and had been since before Gaul, became enraged that a small group of aristocrats had killed their champion. Antony, who had been drifting apart from Caesar, capitalised on the grief of the Roman mob and threatened to unleash them on the Optimates, perhaps with the intent of taking control of Rome himself. To his surprise and chagrin, Caesar had named his grandnephew Gaius Octavian his sole heir, bequeathing him the immensely potent Caesar name and making him one of the wealthiest citizens in the Republic. The crowd at the funeral boiled over, throwing dry branches, furniture and even clothing on to Caesar's funeral pyre, causing the flames to spin out of control, seriously damaging the Forum. The mob then attacked the houses of Brutus and Cassius, where they were repelled only with considerable difficulty, ultimately providing the spark for the Liberators' civil war, fulfilling at least in part Antony's threat against the aristocrats. Antony did not foresee the ultimate outcome of the next series of civil wars, particularly with regard to Caesar's adopted heir. Octavian, aged only 18 when Caesar died, proved to have considerable political skills, and while Antony dealt with Decimus Brutus in the first round of the new civil wars, Octavian consolidated his tenuous position. To combat Brutus and Cassius, who were massing an enormous army in Greece, Antony needed soldiers, the cash from Caesar's war chests, and the legitimacy that Caesar's name would provide for any action he took against them. With the passage of the lex Titia on 27 November 43 BC, the Second Triumvirate was officially formed, composed of Antony, Octavian, and Caesar's loyal cavalry commander Lepidus. It formally deified Caesar as Divus Iulius in 42 BC, and Caesar Octavian henceforth became Divi filius ("Son of a god"). Because Caesar's clemency had resulted in his murder, the Second Triumvirate reinstated the practice of proscription, abandoned since Sulla. It engaged in the legally sanctioned murder of a large number of its opponents to secure funding for its forty-five legions in the second civil war against Brutus and Cassius. Antony and Octavius defeated them at Philippi. Gaius Julius Caesar Octavianus, Caesar's adopted heir. Afterward, Mark Antony formed an alliance with Caesar's lover, Cleopatra, intending to use the fabulously wealthy Egypt as a base to dominate Rome. A third civil war broke out between Octavian on one hand and Antony and Cleopatra on the other. This final civil war, culminating in the latter's defeat at Actium, resulted in the permanent ascendancy of Octavian, who became the first Roman emperor, under the name Caesar Augustus, a name that raised him to the status of a deity. Based on remarks by Plutarch, Caesar is sometimes thought to have suffered from epilepsy. Modern scholarship is "sharply divided" on the subject, and some scholars believe that he was plagued by malaria, particularly during the Sullan proscriptions of the 80s. Despite the commonly held belief that Caesar suffered from epilepsy, several specialists in headache medicine believe that a more accurate diagnosis would be migraine headache. Other scholars contend his epileptic seizures were due to a parasitic infection in the brain by a tapeworm. A line from Shakespeare has sometimes been taken to mean that he was deaf in one ear: Come on my right hand, for this ear is deaf. No classical source mentions hearing impairment in connection with Caesar. The playwright may have been making metaphorical use of a passage in Plutarch that does not refer to deafness at all, but rather to a gesture Alexander of Macedon customarily made. By covering his ear, Alexander indicated that he had turned his attention from an accusation in order to hear the defense. The Roman historian Suetonius describes Caesar as "tall of stature with a fair complexion, shapely limbs, a somewhat full face, and keen black eyes." In Classical Latin, it was pronounced [ˈɡaːjus ˈjuːljus ˈkajsar]. In the days of the late Roman Republic, many historical writings were done in Greek, a language most educated Romans studied. Young wealthy Roman boys were often taught by Greek slaves and sometimes sent to Athens for advanced training, as was Caesar's principal assassin, Brutus. In Greek, during Caesar's time, his family name was written Καίσαρ, reflecting its contemporary pronunciation. Thus, his name is pronounced in a similar way to the pronunciation of the German Kaiser. In Vulgar Latin, the plosive /k/ before front vowels began, due to palatalization, to be pronounced as an affricate – hence renderings like [ˈtʃeːsar] in Italian and [ˈtseːsar] in German regional pronunciations of Latin, as well as the title of Tsar. With the evolution of the Romance languages, the affricate [ts] became a fricative [s] (thus, [ˈseːsar]) in many regional pronunciations, including the French one, from which the modern English pronunciation is derived. The original /k/ is preserved in Norse mythology, where he is manifested as the legendary king Kjárr. Caesar's cognomen would itself become a title; it was greatly promulgated by the Bible, by the famous verse "Render unto Caesar the things which are Caesar's, and unto God the things that are God's". The title became the German Kaiser and Slavic Tsar/Czar. The last tsar in nominal power was Simeon II of Bulgaria whose reign ended in 1946; for two thousand years after Julius Caesar's assassination, there was at least one head of state bearing his name. 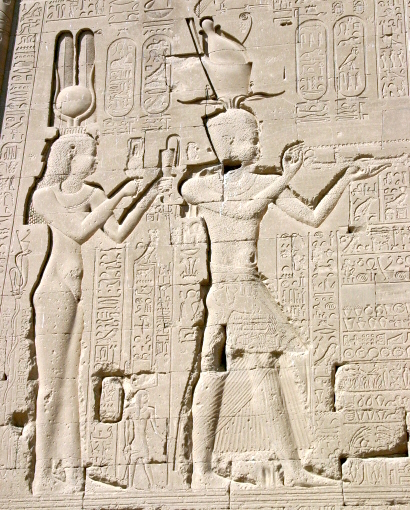 Cleopatra and her son by Julius Caesar, Caesarion at the Temple of Dendera. Roman society viewed the passive role during sexual activity, regardless of gender, to be a sign of submission or inferiority. Indeed, Suetonius says that in Caesar's Gallic triumph, his soldiers sang that, "Caesar may have conquered the Gauls, but Nicomedes conquered Caesar." According to Cicero, Bibulus, Gaius Memmius, and others (mainly Caesar's enemies), he had an affair with Nicomedes IV of Bithynia early in his career. The tales were repeated, referring to Caesar as the Queen of Bithynia, by some Roman politicians as a way to humiliate him. It is very likely that the rumors were spread only as a form of character assassination; Caesar himself denied the accusations repeatedly throughout his lifetime, and according to Cassius Dio, even under oath on one occasion. This form of slander was popular during this time in the Roman Republic to demean and discredit political opponents. A favorite tactic used by the opposition was to accuse a popular political rival as living a Hellenistic lifestyle based on Greek and Eastern culture, where homosexuality and a lavish lifestyle were more acceptable than in Roman tradition. Mark Antony charged that Octavian had earned his adoption by Caesar through sexual favors. Suetonius described Antony's accusation of an affair with Octavian as political slander. Octavian eventually became the first Roman Emperor. For the marble bust from Arles discovered in 2007–8 alleged to be Caesar's likeness, see Arles portrait bust. ↑ Covington, Michael A. (31 March 2010). "Latin Pronunciation Demystiﬁed". University of Georgia. http://www.ai.uga.edu/mc/latinpro.pdf. Retrieved 6 January 2012. ↑ Pliny the Elder, Natural History 7.7. The misconception that Julius Caesar himself was born by Caesarian section dates back at least to the 10th century (Suda kappa 1199). Julius wasn't the first to bear the name, and in his time the procedure was only performed on dead women, while Caesar's mother, Aurelia, lived long after he was born. ↑ Black, Jeremy (2003). A History of the British Isles. Palgrave MacMillan. p. 6. ↑ "Lives of the Noble Grecians and Romans, by Plutarch (chapter48)". http://etext.library.adelaide.edu.au/p/plutarch/lives/chapter48.html. ↑ Thomson, D. F. S.; Sperna Weiland, Jan (1988). "Erasmus and textual scholarship: Suetonius". In Weiland, J. S.. Erasmus of Rotterdam: the man and the scholar. Leiden, Netherlands: E.J. Brill. p. 161. ISBN 90-04-08920-9. ↑ 62.0 62.1 Martin Jehne, Der Staat des Dicators Caesar, Köln/Wien 1987, p. 15-38. ↑ 65.0 65.1 Salisbury, Joyce E (2001). "Cleopatra VII". Women in the ancient world. Santa Barbara, CA: ABC-CLIO. p. 52. ISBN 1-57607-092-1. ↑ Mackay, Christopher S. (2004). Ancient Rome: A Military and Political History. Cambridge University Press. p. 254. ↑ Campbell, J. B. (1994). The Roman Army, 31 BC–AD 337. Routledge. p. 10. ↑ Huzar, Eleanor Goltz (1978). 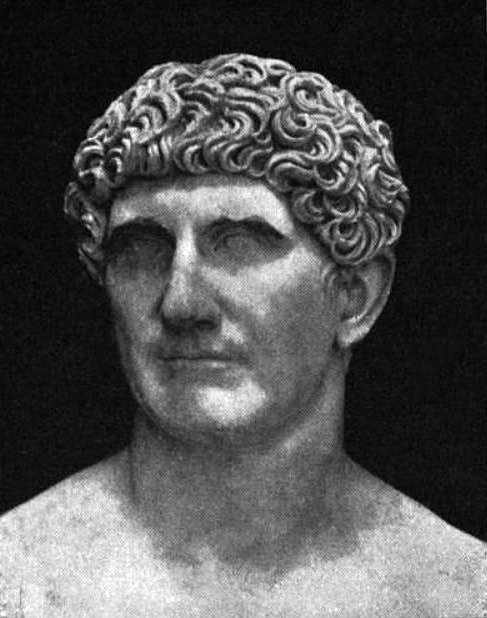 Mark Antony, a biography By Eleanor Goltz Huzar. Minneapolis, MN: University of Minnesota Press. pp. 79–80. ISBN 978-0-8166-0863-8. ↑ "Plutarch – Life of Brutus". Classics.mit.edu. http://classics.mit.edu/Plutarch/m_brutus.html. Retrieved 28 April 2010. ↑ "Suetonius, ',Life of the Caesars, Julius', trans. J C Rolfe". Fordham.edu. http://www.fordham.edu/halsall/ancient/suetonius-julius.html. Retrieved 28 April 2010. ↑ From the J. C. Rolfe translation of 1914: "...he was stabbed with three and twenty wounds, uttering not a word, but merely a groan at the first stroke, though some have written that when Marcus Brutus rushed at him, he said in Greek, 'You too, my child?". ↑ Stone, Jon R. (2005). The Routledge Dictionary of Latin Quotations. London: Routledge. p. 250. ISBN 0-415-96909-3. ↑ Morwood, James (1994). The Pocket Oxford Latin Dictionary (Latin-English). Oxford, England: Oxford University Press. ISBN 0-19-860283-9. ↑ It appears, for example, in Richard Edes's Latin play Caesar Interfectus of 1582 and The True Tragedie of Richarde Duke of Yorke &tc of 1595, Shakespeare's source work for other plays. Dyce, Alexander; (quoting Malone) (1866). The Works of William Shakespeare. London: Chapman and Hall. p. 648. ↑ "Temple of Caesar". Anamericaninrome.com. http://anamericaninrome.com/wp/2011/07/caesars-grave/. Retrieved 8 January 2012. ↑ "Temple of Caesar". Findagrave.com. http://www.findagrave.com/cgi-bin/fg.cgi?page=gr&GRid=7181. Retrieved 8 January 2012. ↑ "Suetonius, Life of Caesar, Chapters LXXXIII, LXXXIV, LXXXV". Ancienthistory.about.com. 29 October 2009. http://ancienthistory.about.com/library/bl/bl_text_suetcaesar.htm. Retrieved 28 April 2010. ↑ Osgood, Josiah (2006). Caesar's Legacy: Civil War and the Emergence of the Roman Empire. Cambridge University Press. p. 60. ↑ Warrior, Valerie M. (2006). Roman Religion. Cambridge University Press. p. 110. ISBN 0-521-82511-3. ↑ Zoch, Paul A. (200). Ancient Rome: An Introductory History. University of Oklahoma Press. pp. 217–218. ISBN 0-8061-3287-6. ↑ Cicero, Phillipic ii.110: Cicero refers to the divine honours of : "...couch, image, pediment, priest" given to Caesar in the months before his assassination. ↑ According to Dio Cassius, 44.6.4. ↑ Bruschi, Fabrizio (2011). "Was Julius Caesar's epilepsy due to neurocysticercosis?". Cell Press. pp. 373–374. http://www.researchgate.net/publication/51493212_Was_Julius_Caesar's_epilepsy_due_to_neurocysticercosis?ev=prf_pub. Retrieved 2 May 2013. ↑ McLachlan, Richard S. (2010). "Julius Caesar's Late Onset Epilepsy: A Case of Historic Proportions". Canadian Journal of Neurological Sciences Inc.. pp. 557–561. http://apps.webofknowledge.com/full_record.do?product=WOS&search_mode=GeneralSearch&qid=4&SID=P2Ajl5d3oe6ha3MO8EF&page=1&doc=2. Retrieved 11 May 2013. ↑ Hughes J; Atanassova, E; Boev, K (2004). "Dictator Perpetuus: Julius Caesar—did he have seizures? If so, what was the etiology?". pp. 756–64. Digital object identifier:10.1016/j.yebeh.2004.05.006. PMID 15380131. ↑ Gomez J, Kotler J, Long J (1995). "Was Julius Caesar's epilepsy due to a brain tumor?". pp. 199–201. PMID 7738524. ↑ H. Schneble (1 January 2003). "Gaius Julius Caesar". German Epilepsy Museum. http://www.epilepsiemuseum.de/alt/caesaren.html. Retrieved 28 August 2008. ↑ Hodder, Harbour Fraser (September 2003). "Epilepsy and Empire, Caveat Caesar". Harvard, Boston: Harvard University. p. 19. http://www.forensic-psych.com/articles/artHarvardMagCaesar.php. ↑ Edward Courtney, The Fragmentary Latin Poets (Oxford: Clarendon Press, 1993), pp. 153–155 and 187–188. See also Poems by Julius Caesar. ↑ T.P. Wiseman, “The Publication of De Bello Gallico,” Julius Caesar as Artful Reporter (Classical Press of Wales, 1998). Caesar was acclaimed Imperator in 60 and 45 BC. In the Roman Republic, this was an honorary title assumed by certain military commanders. After an especially great victory, an army's troops in the field would proclaim their commander imperator, an acclamation necessary for a general to apply to the Senate for a triumph. After being acclaimed imperator, the victorious general had a right to use the title after his name until the time of his triumph, where he would relinquish the title as well as his imperium.